Whenever I’m pulling deadly nightshade out of the garden I get terribly curious about how the fruit of this plant must taste. I’m thankful that I never had this urge while I was a child. I also get to thinking about how I could try a witch’s flying potion with ingredients from my garden: nightshade, monkshood (aconite) and poppy being right at hand. So I turned my curiosity towards other poisonous plants. And there are many. 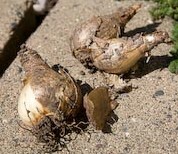 For example, my beloved daffodils are poisonous. Or, at least, the bulbs are. I’ve read that Roman soldiers carried the bulbs to be used as a sort of cyanide pill (0r in this case an alkaloid pill) to commit suicide rather than die of painful sword or spear injuries. Botantical.com informs us that “an extract of the bulbs, when applied to open wounds, has produced staggering, numbness of the whole nervous system and paralysis of the heart.” No recipe for the extract is provided, thankfully. What could be safer than an apple? I recall the Alar and apple scare back in the 1980s, but we’ve all been eating an apple a day since then, right? I think I’m still safe in doing so. But not those lazy or thrifty people who eat the entire apple. If you eat enough of the seeds, apples can kill you. The pips hide cyanide within. Luckily we can detoxify small quantities in our own bodies, so you’d have to swallow a lot of the seeds before succumbing to the poison. Still, it’s a little disconcerting to see the ubiquitous fruit listed in Poisonous Plants of North Carolina. If you don’t want to commit suicide with some common plant like lily-of-the-valley or rhubarb, you could go the route of folks in Vietnam or Sre Lanka. I found a report on la ngong (Gelsemium elegans) being used for suicides in Vietnam in 2007. It’s a very lovely vine with yellow flowers. It must be hard to pass by. Six people died after drinking wine in which the roots of the plant had been soaked. Sri Lankans prefer to use the yellow orleander. It sounds rather romantic and dramatic. And for a while, it was quite the thing to do. “Yellow Oleander Plants Fuels Suicide Rates In Sri Lanka” reads a headline from 2006. You can also find all sorts of medical reports on the problem. Plants don’t just cause us harm; they go after cute fluffy animals, too. And in cruel and weedy ways. Consider the mallow which most gardeners curse themselves for ever planting. It’s evil enough. But another variety of the mallow, the tree mallow, is after the puffin. It covers the ground so thickly that the puffins can’t make nests. If you’re curious about other poisonous plants, there’s a quirky little site written by the Poison Garden Warden. After checking it out, go watch the video at the Alnwick Gardens site. I HAVE to go visit the garden. They grow cannabis in a cage! And you say that my firearms hobby is dangerous…!